88% of children who grow up in evangelical homes leave the church by the age of eighteen, never to return. 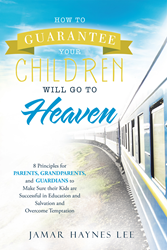 Through his new book, “How to Guarantee Your CHILDREN Go to Heaven,” the Rev. Jamar Haynes Lee is helping pastors and parents turn this around. In the book, Haynes Lee explains how parents and grandparents can teach children to grow up desiring a daily relationship with Jesus, as opposed to treating him like a Sunday morning obligation. “How to Guarantee Your CHILDREN Will Go to Heaven” will call parents to lead their children to Christ with love and patience. The Rev. Jamar Haynes Lee has been in ministry for over 20 years. Jamar and his wife Cassandra are the founders of Family & Marriage Enrichment and have a heart to help families flourish. Together they also head the Youth Ministry at Glory To God Ministries in Canal Winchester, Ohio. To learn more about Haynes Lee and Glory To God Ministries, please visit http://jamarhayneslee.com.